Taiwan Legislator and Congressman, Jason Hsu, plans to turn Taiwan into the world’s next blockchain island and crypto nation. Given the nickname, “Crypto Congressman” by Vitalik Buterin, Hsu worked as a tech entrepreneur before getting involved with politics. In 2016, Hsu became an official legislature and member of parliament in Taiwan, focusing much of his attention on bridging the gap between public policy and technology. He has since introduced several initiatives around autonomous vehicles, cyber security legislation, digital economy laws, and is now focusing his attention on crypto and blockchain legislations. After meeting Hsu in San Francisco during a private fireside chat with Vitalik Buterin, I had the chance to learn more about his plans to turn Taiwan into a blockchain island and crypto nation. Rachel Wolfson: What crypto and blockchain laws are you currently working on implementing? Jason Hsu: We have set up a parliamentary coalition in Taiwan’s parliament for blockchain, which is a bipartisan alliance designed to help support the industry. I have also launched self-regulatory organizations (SRO) for blockchain and crypto, where we are working together to come up with a set of guidelines to regulate exchanges. These guidelines will provide basic parameters as to how crypto exchanges and other taxations are defined. When we announce the guidelines in the coming weeks, it will be a regional consensus with Taiwan, Japan and Korea, Singapore, Hong Kong as well as other Asian countries. We are also organizing an Asia SRO Summit in November to bring together regulators and industries to discuss guiding principles. Additionally, I have also recently launched “One Crypto World” (OCW) tokens to be distributed among global thought leaders in the blockchain space. The amount of OCW is limited to 1,000. OCW is issued via ERC-20 and contain no value; nor will it be traded on exchanges. OCW is more of a badge than a token, acting as a proof of support to policies, initiatives and legislations that I am pushing forward. So far those who have received my OCWs include the mayor of Seoul and the chairman of the Korean Blockchain Association. I will be giving Vitalik Buterin one OCW as well. Wolfson: What guidelines you are planning on drafting for Taiwan? Hsu: The guidelines are basically a set of principles explaining how exchanges should regulate themselves. These principles include: regulatory abidance, information transparency,prudent administration, operational risk management and market, liquidity and credit risk management. For example, when there is an Initial Coin Offering (ICO) listed on exchanges, they must disclose their investors’ background. Exchanges must separate and safeguard customers’ assets and conduct onboarding due diligence through multi-level authentication. Exchanges must hold sufficient liquid net assets to cover potential business losses. Also, there are very strict know your customer (KYC) and anti-money laundering(AML) rules. In regards to some of the scams and certain incorrect behaviors we have seen with ICOs, the SRO will vote to decide if certain behavior is allowed or not, which we will review in a peer-to-peer manner periodically. Wolfson: What are the most important factors needed to drive innovation in the blockchain space? Hsu: First, an open minded regulatory perspective is needed. Technology is evolving exponentially and regulators must evolve as technology does. We then need to enable daily use cases of blockchain. Governments should think about how to create environmental situations where citizens are allowed to use this technology and feel that it is a part of their lives. Next, we need to think about the developing countries and how we can get the technology to them. It is necessary to get the technology to the bottom of the pyramid and have them use it. Finally, education is very important. In regards to blockchain, education is needed from the school curriculum perspective. A lot needs to be done from the consumer and entrepreneurial perspectives as well. For instance, when you mention ICOs in certain places, people think of a scam. The government and general public must be informed and educated with knowledge about how to behave in a conscious way. Wolfson: How are you planning to turn Taiwan into a blockchain island and crypto nation? 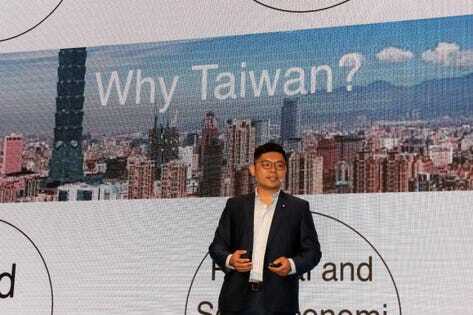 Hsu: We are now developing a “special economic zone,” where we are bringing 200 global blockchain companies to be headquartered in Taiwan. We are also working on developing a digital identity solution called “Taiwan global ID,” which will allow us to let citizens have their visas on the blockchain. Furthermore, during my recent trip to California I spoke with well-known entrepreneur, Peter Thiel, about the problem of mining power being controlled by one or two players right now. The big company that is going to IPO soon in Hong Kong is likely to control 51% of the hash power. In terms of the future of Bitcoin, one thing I do want to point out is the fear that big players will have dominant hash power. Mining is becoming centralized and monopolized on the blockchain, which defeats the purpose of decentralization. Wolfson: Are you working on a solution to this? Hsu: In Taiwan, we are working on a solution called “decentralized mining.” We want to leverage Taiwan’s core strength in IC chip design and semiconductors and build faster and more efficient mining chips. This will be a crowdfunding mining project, which will allow everyone to participate. Instead of one company producing mining machines that mine the heck out of it, we enable the average person to mine and contribute to the ecosystem. The decentralization of hashing power is tantamount to genesis of Bitcoin’s peer-to-peer network. Wolfson: What are your general thoughts on ICOs? Hsu: I think that the crypto industry needs a correction of course when it comes to ICOs. For instance, too much focus remains on the price of crypto, yet not enough on the execution of the projects. In terms of ICOs, there must be a more thought through framework for information disclosure. That is why part of our efforts is to create guidelines for information disclosure on ICOs. Moreover, not every blockchain project has to do an ICO. When you launch an ICO, all the attention and efforts are typically on the ICO and not on the project execution. I’d like to see more projects being defined as actual use cases for blockchain applications with less focus on the ICO . Wolfson: What ICOs do you see potential in today? Hsu: In terms of ICOs with potential, I am a big believer in identity. Blockchain technology can give people access to information across different resources. For instance, it’s impactful if blockchain technology is being used to build applications on identities to help bank the unbanked or support refugees. I’d also like to see countries embrace the cross border digital economy strategy. More country-to-country protocols are currently being set up. However, blockchain is still in its early stages. We have barely scratched the surface, so I will say that a challenge in the next five years is just understanding how to go from cutting edge ideas to actual use cases. Also, as Vitalik Buterin mentioned during his fireside chat, governments should be able to allow for the daily use of blockchain and crypto, letting every day citizens access these tools. Wolfson: What are your thoughts on security tokens? Hsu: I think that 2017 was the year for ICOs and that 2018 is moving from a bull market to a bear market. And I believe 2019 will be the year of security tokens. We need to watch the space carefully, as countries are coming up with rules as to how to regulate and define security tokens. The G20 summit held in Argentina this year is likely to have some big announcements, where several countries will define security tokens. Moreover, investors are moving away from buying tokens and are becoming interested in equity. In terms of regulations, I am working on developing a clear definition of security tokens, which will be coupled with the banking and securities law, along with some waiver and exemption based off blockchain technology. In 2019, I think Japan will be the country that is regulating security tokens to ensure general guiding rules of the overall industry. Real estate assets as security tokens are also becoming a trend, as more countries are moving towards digitalized assets. For example, many private equity firms are looking to liquidate their client projects based off a virtual assets strategy. The special economic zone that I am developing for blockchain will have a waiver within the zone to develop virtual real estate projects there. Wolfson: Do you think we will see the end of ICOs with the emergence of security tokens? Hsu: Like I said, I’d like to see ICOs being applied to people who really can benefit. I do, however, think that more projects will move towards securities, as investors and regulators want this. Wolfson: What are your thoughts on the future of Bitcoin? Hsu: I think that Bitcoin is really the genesis of all cryptos. It is clearly the simplest application and most elegant use of the blockchain. I believe that Bitcoin is here to stay because of its purity and applications to alternative finance . However, I do find the competitions among different protocols to be freighting. For example, consider projects that are raising a lot of money and fail to deliver. If you compare that to Bitcoin, you see that projects don’t achieve what they promised. But, I do think that more treasuries of governments will start to treat Bitcoin as a part of their policies, therefore, I remain optimistic for Bitcoin’s future. Wolfson: How did you become friendly with Vitalik Buterin? Hsu: My relationship with Vitalik started after September 3, 2017, when China banned ICOs. I held a public hearing with our prime minister and openly asked for Vitalik’s support for blockchain and crypto in Taiwan. Vitalik took note of this and we were then introduced. He shared advice and insights on what he thought of the industry. I see him as my personal advisor. In fact, Vitalik is one of the few people left in the industry that remains true to the ideals that blockchain and crypto were built upon.